As an organization, the Girl Scouts pride themselves on empowering young women and enabling them to follow their dreams through leadership experiences and opportunities. The Girl Scouts are an inclusive group of women that center their focus “around STEM, the outdoors, development of life skills, and entrepreneurship” (Girl Scouts). With approximately 2.6 million members, both adults and children, the Girl Scouts are empowering women to make changes. The Girl Scouts of the Sierra Nevada have put together their 16th annual TRIUMPHANT: Celebrating Women in Leadership Awards and Dinner. There, they honored six women leaders within the Northern Nevada community; there were approximately 30 nominees. The categories for which they honored these women are: Environmental Leadership, STEM, Community Service, Healthy Living, Financial Literacy, and Entrepreneurship. 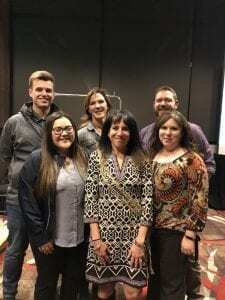 This event was held at the Nugget Casino on November 15, 2018. All of the proceeds are benefiting the Girl Scouts. Karen Purcell, founder and president of PK Electrical, was the honoree for the entrepreneurship category. Karen’s entrepreneurial skills have assisted her in creating a successful business that has seen substantial growth. She opened PK Electrical 1996; initially, there was one office in Reno, Nevada but the business has since expanded to another location in Denver, Colorado. Karen’s dedication towards women in STEM has motivated her to become a mentor to girls to help them discover ways in which they can break into STEM careers, and explore more STEM learning opportunities. Karen’s book, “Unlocking Your Brilliance: Smart Strategies for Women to Thrive in Science, Technology, Engineering, and Math,” describes her experiences as an entrepreneur and female engineer, focusing on her challenges, successes, and gives advice to other women looking to pursue this heavily male-dominated field. Karen is also the founder of STEMspire, a non-profit dedicated to empowering women to succeed in the STEM fields. Karen is honored to have been chosen for this award and wants young women to keep learning in order to grow into the leaders that she knows they can be. She is passionate about inspiring women in STEM and will always be their biggest advocate. If you would like to learn more about The Girl Scouts, please go to their website: www.girlscouts.org.